There's a big world out there filled with islands just waiting for your arrival. 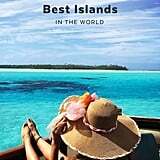 We curated the 49 best islands across the globe that you absolutely must visit before you die. Time to get out the bucket list.